The 4,000-square-foot beer hall was modeled after one in Munich. At Krause’s Cafe and Biergarten in downtown New Braunfels, the writing’s on the wall. But rather than an ominous warning, the sausage recipe painted on the building’s exterior, along with murals of Krause family members, reflects New Braunfels’ German heritage and how this restaurant, established in the late 1930s, plays a starring role in that history. While the German eatery enjoyed decades of success under husband-and-wife team Kermit and Mildred Krause, business eventually declined, and it closed in the late 1990s. The historic property changed hands, and other dining establishments tried to make a home there, but nothing stuck. Developer Ron Snider bought the vacant building in 2002 after realizing that it shared a parking lot with the Seekatz Opera House he was building. He’d been going to the restaurant since the ’70s and was sad to see it in disrepair. He noticed people peering through the closed doors to see what would become of the beloved café. Snider leased it to a restaurant owner, but that didn’t end up working out either. He decided to take matters into his own hands and reinvent the restaurant himself, with a goal of restoring it to its former glory as a place to meet with friends, family, and neighbors over an ice-cold beer and hot schnitzel. 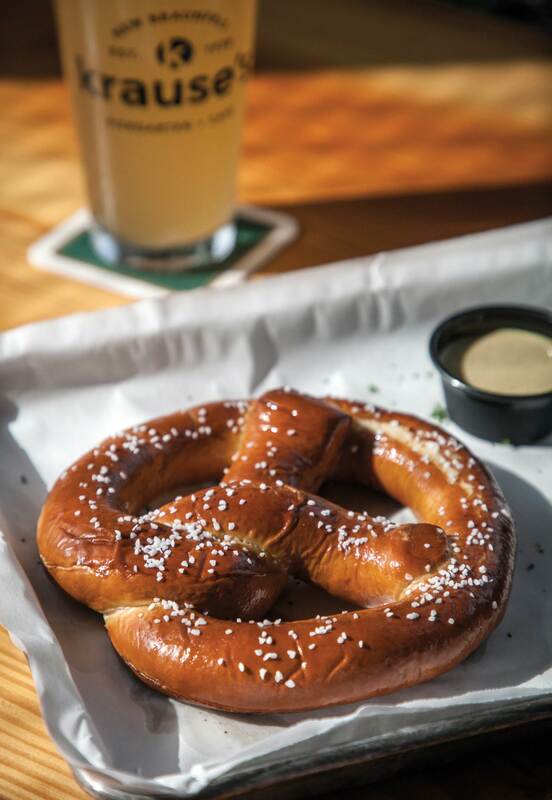 Start off your meal at Krause’s with a Bavarian pretzel. After two years of renovations, the new iteration of Krause’s Cafe opened in December 2016. The original dining room, a small space with a long bar and no windows, still stands—the ceiling with its exposed wood beams is the same one from the 1940s. On most days, though, you’ll find the crowds in the massive beer hall and beer garden, both featuring stages where bands often play. 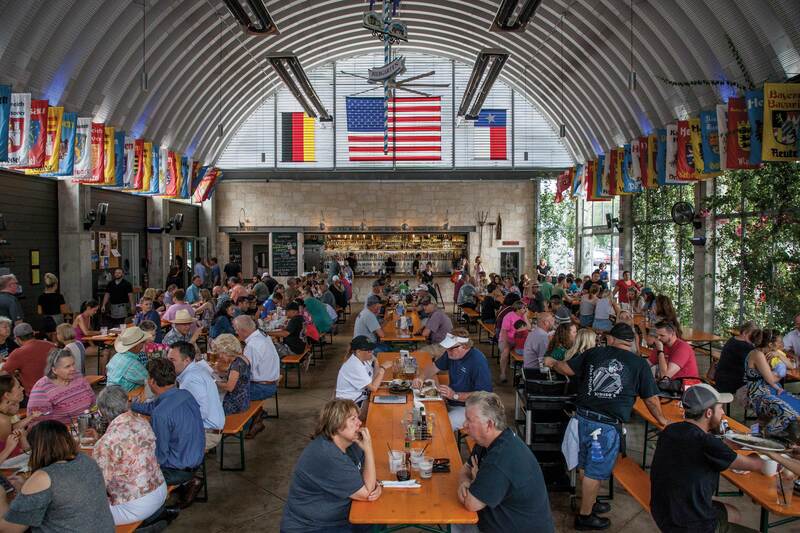 The beer hall—a sight to behold at 4,000 square feet—looks like it was plucked from Bavaria and dropped in Central Texas. Indeed, the steel-domed roof is modeled after the Hofbräuhaus beer hall in Munich. Long tables with benches crafted from reclaimed wood encourage conversation and new friendships over steins of Kölsch. The hall, flooded with light thanks to floor-to-ceiling windows, features an homage to New Braunfels’ history—all you have to do is look up. Dozens of flags featuring the crests of the town’s founding German, Swiss, and Alsatian families flank the space. (Krause’s worked with the local Sophienburg Museum to get the flags and crests right.) Also in the hall is the impressive sight of 80 taps featuring mostly Texas craft and German brews—after all, Krause’s did have roots as a lunch counter where diners could get beer with their meals; Gene Krause started the first generation of the establishment in 1938 as Gene’s Place on New Braunfels’ main plaza. For a sampling of German classics or a refreshing cap to a float on the Comal River, opt for an $8 flight of Hofbräu Dunkel, Sünner Kölsch, and Bitburger. Krause’s offers a smaller menu today, but it’s not anemic by any stretch of the imagination. With daily breakfast, lunch, and dinner service, there are plenty of dishes to try, from the revered Reuben sandwich during the midday rush to an apple fritter and cup of coffee during weekend mornings while the local farmers market sets up in the parking lot. One of the classic dinner options at Krause’s is the bratwurst platter. But dinner is your best bet for the full Texas-German cuisine experience. You could do very well for yourself with a carefully curated spread of starters: the kartoffel poppers, deep-fried mounds of shredded potato (high on the scale of great things you can do with potatoes) served with applesauce for dipping, the big-as-your-head Bavarian pretzel with warm beer cheese, and the sausage sampler with three variations on a platter with cheese, mustard, crackers, and pickles. If you’re not the grazing type, entreés like the bratwurst platter—with sauerkraut, red cabbage, cottage-fried potatoes, and two bratwursts from New Braunfels Smokehouse—the cheesy spaetzle with pork belly, and the chicken jaeger schnitzel with mushroom-wine gravy are sure to satisfy. 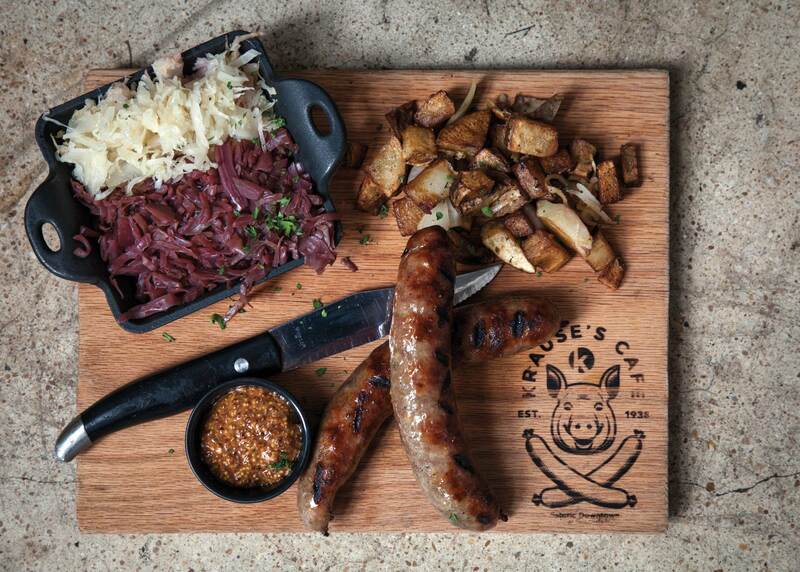 If you want to get really festive, with 24 hours notice you can order a roasted half hog’s head, which might be the perfect treat to share with pals at Krause’s blow-out, monthlong Oktoberfest celebration. After two decades without Krause’s, New Braunfels didn’t just miss the red cabbage dish or sausage—it longed for its community gathering place. After all, it was here where the stammtisch, or “table,” of New Braunfels leaders met to discuss politics and local affairs. These days, the regulars are friendlier, so as you settle in for pretzels, bratwurst, and a pint, keep your ears wide open—you never know what kinds of historic conversations you might overhear.